For MSDS SDS of Pipe Pickle Manufacturers Please write to us. PipePickle is a multipurpose formulation designed to remove pipe dope, mud and cement debris, mill scale, mineral scales and corrosion byproducts from well tubulars and workstrings prior to acid stimulation treatments. Introduction of these contaminants into the formation during stimulation treatment can cause loss of well performance. PipePickle is an emulsion containing aromatic solvents, hydrochloric acid, emulsifier, iron control agents, and corrosion inhibitor. PipePickle delivers versatility as a two-phase fluid that offers solvency as well acid, thus stripping the pipe dope out of the way for the acid to react with corrosion byproducts, mill scale and mineral scales. PipePickle is recommended prior to all stimulation treatments. 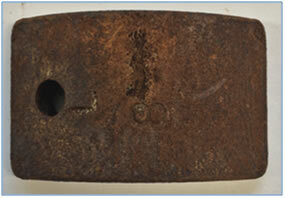 Heavily rusted corrosion coupon was utilized in pipe dope and rust removal test (Figure 1). 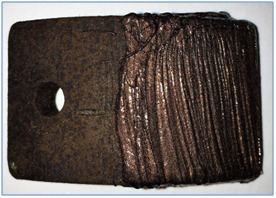 One half of the surface of rusted coupon was covered with KOPR-KOTE (pipe dope) as shown in Figures 2. PipePickle solution (200 ml) was heated to 150°F in Ofite 900 viscometer cup. After the PipePickle solution came to temperature, the rusted coupon with pipe dope was gently placed in viscometer cup. The coupon was allowed to react with PipePickle solution for 20 minutes under moderate shear. 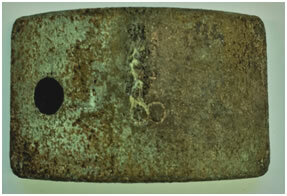 After the 20-minutes reaction time, the coupon was removed from the cup, dipped in distilled water, and allowed to air dry as shown in Figure 3. PipePickle solution yielded perfect cleaning of pipe dope and complete rust removal. A pickling treatment of both tubing and annulus is more effective than tubing only. Use 150 gallons of PipePickle per 1,000 ft of tubing. If the casing is also to be pickled, the volume to use may need to be adjusted. At least 15 minutes of contact time is recommended for pickling at 150 oF. Higher temperatures may require less contact time. Since PipePickle is an emulsion, some fluid separation may occur upon prolonged storage. Gentle mixing is required to restore the emulsion. Mixing can be accomplished with an agitator or circulating the contents of the container with a suitable pump. Global from Houston, TX-USA, Midland, TX-USA and Bombay, India.